Oculoplasty deals with external structures of the eye. Common problems include droopy eye lid(ptosis), inturning or out ward turning of the lids and naso lacrimal duct problems. Lid and orbital tumors though rare are not uncommon. This clinic deals with efficient management of these disorders. Orbital fractures caused by trauma can be managed efficiently. A part of this specialty deals with aesthetic aspects to correct ageing sequences. Oculoplasty focuses on abnormalities of the structures around the eye. The structures include the eyelids, the tear ducts and the orbit (bony socket surrounding the eye). Ophthalmic plastic surgeons are board-certified ophthalmologists who have completed additional training in ophthalmic problems like ptosis, dry eye, naso lacrimal duct problems, traumatic and age related disfigurement. Oculoplastic procedures frequently have both functional and aesthetic purposes. For example, Blepharoplasty, a procedure for excessive and droopy eyelid skin, may improve peripheral vision as well as add facial beauty and rejuvenation. It aims at improving function, comfort and appearance. Cosmetic and therapeutic application of Botox for different ophthalmic disorders is successfully being done. We make custom made prosthesis as well. Ptosis is an abnormal drooping of the upper eyelid in straight gaze. It happens when one or both of the muscles that lift the upper lid aren’t working properly or have become loosened from their positions above the lid. 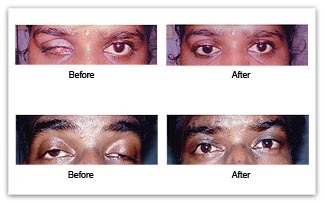 Correction of ptosis is mainly surgical. Various surgeries like frontalis sling, levator resection, levator reinsertion and conjmullerectomy are being done. Entropion is a malposition resulting in inversion of the eyelid margin. The morbidity of the condition is a result of ocular surface irritation and damage. Treatment depends on the etiology. Blepharoplasty is a surgery that includes repairing droopy eyelids by removing excess skin, muscle and fat. Common orbital tumors in children are desmoids (cysts of the lining of the bone) and hemangiomas (blood vessel tumors). Rhabdomyosarcoma is the most common malignant tumor-affecting children. The most common orbital tumors in adults are also blood vessels tumors, including hemangioma, lumphangioma, and arteriovenous malformation. Metastictumors mostfrequently arise from the breast and prostate, while squamous and basel cell cancer can invade the orbit from surrounding skin and sinus cavities. Nasolacrimal duct obstruction is a blockage of the lacrimal drainage system. Child presents with watering since birth. Chronic inflammation of the lacrymal gland is called dacryocystitis. DCR (dacryocystorhinostomy) is done to by-pass the blockages in the nasolacrimal duct. The tear sac is directly connected to the nasal cavity. Being youthful is what everyone desires. Ageing is unavoidable, but we can alleviate the signs of aging by giving botox injection which is a simple outpatient procedure. We correct frown lines, crows feet, bunny lines, brow abnormalities and forehead lines. Injectable cosmetic wrinkle fillers can be injected subcutaneously to help fill in facial wrinkles and restore a smoother appearance. Most of these wrinkle fillers are temporary because the body eventually absorbs them. Some people may need more than one injection to achieve the wrinkle-smoothing effect. The effect lasts for about six months or longer. Ocular prosthesis or artificial eye replaces an absent normal eye after it is being enucleated or eviscerated. Ocularists and eye surgeons work together to make the most realistic artificial eye.